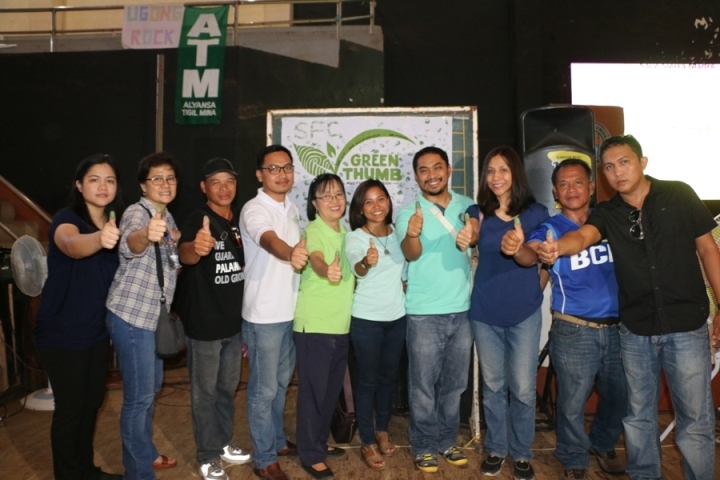 Civic groups, students, senior citizens, environmental activists, religious groups and selected running candidates for 2016 local election gathered in Palawan State University’s gymnasium to heed the green agenda of Green Thumb Coalition on February 27, 2016. Green Thumbs-up for a green environment: (L-R) Mikhaila Ortega- Youth Representative; Dr. Patty Ortega-Justice for Doc Gerry Ortega Movement; Danny Cabiguen-Palawan NGO Network Board of Trustee; Atty. Aaron Pedrosa of SANLAKAS, Atty. Grizelda Mayo Anda-Executive Director of Environmental Legal Assistance Center; Jessa Garibay of Center of Sustainability; Fr. Jasper Taha of Social Action Center; Cynthia Sumagaysay of Palawan Alliance for Clean Energy; Teofilo Tredez of Calategas Irrigators Association, and Marlon Tamsi of ALKFI-BK Palawan. Almost 5, 000 individuals from Puerto Princesa, Palawan joined the launching of Green Thumb Coalition – a green movement for politicians to put socio-environmental issues on their electoral platforms as well as to raise awareness among voters urging them to vote “green” candidates. Green Thumb Coalition or GTC is a coalition of local and national organizations urging national and local politicians especially the presidential candidates to be warriors of the environment. Palawan is the fifth province where the coalition was launched. Five environmental issues in Palawan were discussed namely; mining, coal plant, oil palm expansion, land-grabbing of Indigenous people and conversion of forest zones. “Napakahalaga na sa darating na eleksyon ang iboboto natin ay yung kandidato na berde,” said Atty. Grizelda Mayo-Anda, Executive Director of Environmental Legal Assistance Center (ELAC). Former Puerto Princesa Mayor Edward Hagedorn, incumbent Mayor Lucilo Bayron, running for Governor Arthur Ventura, running for Mayor Rocky Austria, and few individuals running for City Councilors are among the Palawan candidates who accepted the “green” challenge of the coalition. These are just some of the many politicians who signed the covenant and are willing to support and protect the environment. Also present during the launch were singers Jovit Baldivino and Young JV who gave full support and campaign for the environment. Atty. Aaron Pedrosa of SANLAKAS partylist also encouraged the youth of Puerto Princesa during their Youth Stand “Ibalik ang Sigla ng Puerto Princesa”. These are young individuals who condemn mining in the province and urged politicians to support the youth as well as the natural resources in Palawan. Green Thumb Coalition was first conceived in Palawan after the Save Palawan Movement launched the “No to Mining” in 2011, a campaign signed by 10 million individuals to cease the destruction of natural resources in the Province.